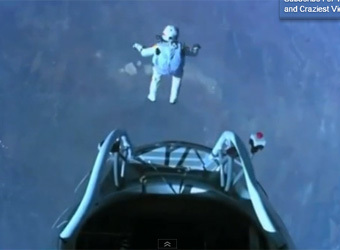 Felix Baumgartner’s jump from the edge of space broke the record for the “live stream with the most concurrent views ever on YouTube”, according to the video-sharing website. The jump, which saw the Austrian daredevil become the first man to break the sound barrier with his own body, attracted more than eight million concurrent live streams at its peak, YouTube said in a blog post. The feat was broadcast on Red Bull’s YouTube channel, as well as on television via a Seven News special on 7mate, allowing viewers to follow the jump live from the balloon’s launch in Roswell, New Mexico on Sunday. Baumgartner broke records for the highest jump from a platform (128,100 feet), the longest distance freefall (119,846 feet) and the maximum vertical velocity (1342.03 kilometres per hour). Red Bull’s content strategy, run by its Red Bull Media house, produces a raft of premium content focused on extreme sports and boasts a YouTube following of over 500,000 subscribers.